It's Monday and we are going retro with PE does a body good. At RockSports we encourage physical activity for all people. We are also big fans of AAHPERD. AAHPERD stands for American Alliance for Health, Physical Education, Recreation, and Dance. According to the AAHPERD website, "AAHPERD envisions a society in which all individuals enjoy an optimal quality of life through appreciation of and participation in an active and creative, health-promoting lifestyle." We will be at the Southern District AAHPERD conference. If you are headed there and want to get a head start on your t-shirt purchasing. 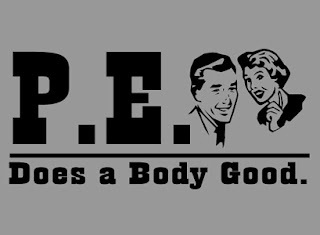 PE does a body good will only cost you $5.00, if you order it today (or tomorrow morning).